"It's October again and the leaves are coming down, one more years come and gone and nothing's changed at all. Wasn't I supposed to be someone to face the fears that I've been running from. Let me feel I don't care if I break down, Let me fall even if I hit the ground and if I cry a little, die a little, at least I'll know I lived just a little"
My Parents have been in our hometown in Northern California for the last 5 days. Dad said it's overcast, drizzling, and the leaves are of brown, orange, and red. I miss that kind of weather. As a kid I remember Dad raking up the leaves that would fall off our tree out in the front yard and then let my older sister and I jump in them. Are kids still living a life like that in 2015? God I hope so. I would give anything to be able to jump in a big pile of leaves again. But, here in one-season San Diego, it never happens. And so, here i am looking out the front bay window at palm trees, a clear blue sky, and 81 degree weather. Call me a complainer but I'd much rather be watching a rain storm outside that's making the colorful leaves flutter to the ground below. There is just something about October that I love; how the colors begin to change, how the wind begins to send a chill causing us to wrap up in sweaters, how the rain falls and dances down the surface of windows, the smells of pumpkin, warm tea, hot coffee, freshly baked pies when they fill our homes. I absolutely love October. 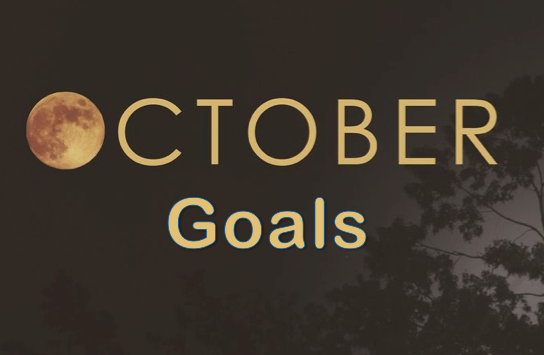 October being one of my absolutely favorite months makes for good blogging material. I have so many ideas I'm so excited to share with you all. From DIY's, to pumpkin patches, to yummy treats. From October - December is my absolutely the best time to be in the kitchen. I love finding new recipes for pies, cookies, and all things yummy treats. It reminds me of grandma's house and how she always had something sweet on the counter. I really hope to bake a lot this month. Everything we received from our wedding last April 2014 is packed up in boxes. But we still have quite a bit of glassware in the kitchen and our room that we need to pack up. I'd really like to get the rest of it packed up so we don't have to worry about it at the end of the month when we begin to move. All of our holiday decor is packed up and ready for the move but I'd like to decorate just a little so it looks like Halloween and October around here until we move. I have a few DIY projects that I'd like to do before the end of the month. Every year we go to a local pumpkin patch with our family, last year we were so busy during October that we weren't able to go and I was really sad. I'd really like to go this year because it's my favorite October tradition. I found a really cute Welcome Sign on Pinterest that I would love to have in the front of our home when we move. I've been wanting to paint more and I figured I could hit two birds with one stone, DIY projects and creating a welcome sign for the new house. I've been selling Scentsy for 3 years and I love it. I found that my favorite time of year to sell scentsy is October-December because I love the holiday scents and warmers. When we go engaged I knew I wanted to make an Engagement Album full of all of the photos from our Engagement Shoot. It ended up working out nicely because we used the album as our guest book at the Wedding. I have been telling Speedracer that I would really love a Wedding Album but I've been picky as to what I'd like to look like. We've been married for coming up 1 year and 1/2, I'd really like to have a wedding album in our new home. Where did you order your wedding album from? How did you create a wedding album? [ 9 ] Watch the 13 nights of Halloween. Who is with me? I am so excited to watch The Adams Family and Hocus Pocus on repeat!!! 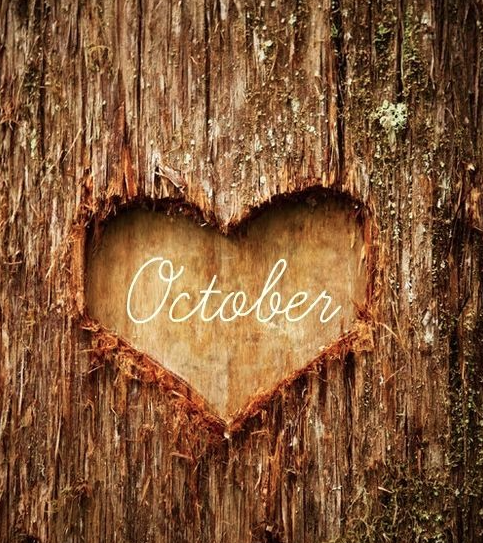 Welcome October 2015, I cannot wait to celebrate you.